– Clay Buckley, President of CauseNetwork, Inc.
MCLEAN, VA, February 08, 2018 /24-7PressRelease/ — CauseNetwork announced the launch of a new tool in its fundraising arsenal – GiveMyCoins.org. 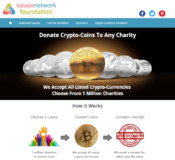 Every charity on the CauseNetwork platform can now accept cryptocurrency donations, and individuals can donate cryptocurrency by visiting www.GiveMyCoins.org and selecting from the entire IRS database of approved 501(c)(3) organizations. The GiveMyCoins beneficial feature is now integrated into CauseNetwork’s free customized website and mobile app platform. It provides a simple-to-use way for any charity to accept cryptocurrency donations. Donors immediately receive receipts for their tax-deductible donation at that day’s current market price. Charities then receive the net proceeds from the conversion of these coins into dollars after transaction costs and exchange fees. CauseNetwork,Inc. operates as an agency serving the mission of The CauseNetwork Foundation. The CauseNetwork platform provides a free website, mobile app and browser app to any charity, enabling multiple fundraising methods. Currently more than five hundred (500) charities of all sizes utilize this fundraising solution. CauseNetwork offers options for charities, supporters and businesses to all become part of the cause commerce social impact movement. To learn more, visit https://www.CauseNetwork.com. The CauseNetwork Foundation is a 501(C)(3) non-profit organization registered with the IRS and the state of Virginia. The Foundation was formed to facilitate alternative and non-cash donations from consumers and businesses to charities. It coordinates all logistics, tracking, and settlement processes for vehicle, electronics, shopping and now digital currency donation programs.